The Chrysanthemums and More! exhibition features a celebration of all things local with vibrant chrysanthemum displays, family-friendly activities and more, September 21 to October 28. Visit the Children’s Garden for lots of fall family fun. Activities include something for all your senses—Press and Pound Color Banners, Autumn-themed Stories, Tree Vest Craft and an “I-Spy” Naturalist Walk about trees. Enjoy giant pumpkins on display at Michigan’s Farm Garden. Weighing in at hundreds of pounds, these pumpkins will amaze kids and adults alike. Learn all about pumpkins as you sort varieties and answer quiz questions at the Pumpkin Discovery cart. Or try your hand at a pumpkin bean bag toss and play a unique pumpkin game “Which Vine is Mine?” to learn about how pumpkins grow. Enjoy tours and demonstrations led by members of the horticulture department. Eat, drink, and dance in the crisp autumn air. A food truck and the Balk Café will be serving up local fresh fare along with West Michigan beers, hot cider, and adult cocktails. Dance to a string band with accompanying square dance caller. 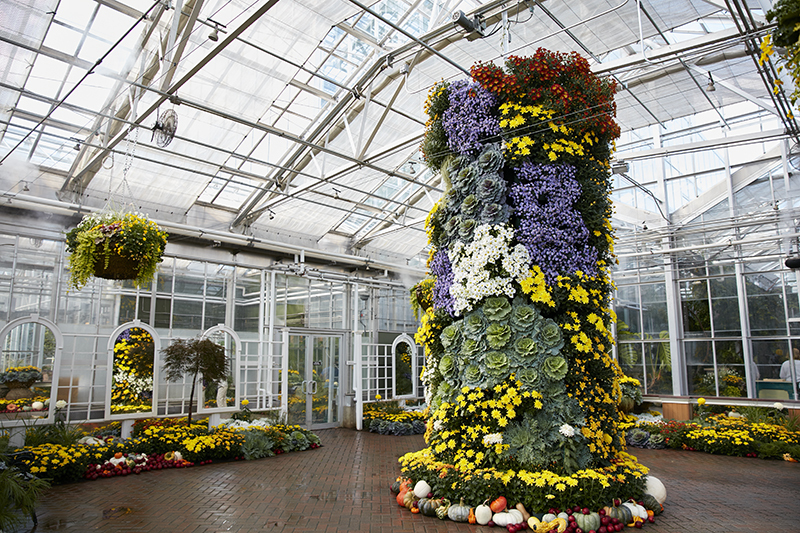 Frederik Meijer Gardens & Sculpture Park is pleased to present the annual fall horticulture exhibition, Chrysanthemums and More! opening to the public on September 21. This exhibition, the largest of its kind in Michigan, features expansive displays of chrysanthemums, fall foliage and family-friendly activities. The exhibition will be on display through October 28. This year’s focus will be on “Growing Local”, highlighting the local growers, farms, food and drink featured at Meijer Gardens. Guests will enjoy a wide variety of locally grown elements, including decorative, spoon, cushion, and quill chrysanthemums, with “pompon” blooms as small as a nickel to showy “spider” blooms measuring six inches or more in diameter. This exhibition is a feast for the eyes, displaying the versatility of the magnificent mum and much more. Visitors will be greeted with vibrant displays of chrysanthemums from the moment that they arrive and delighted by abundant floral arrangements of these bold blooms as they walk through the scenic corridor inside of the main building. 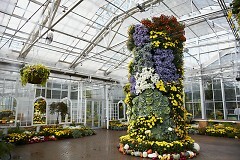 Upon entering the Seasonal Display Greenhouse, a floor-to-ceiling chrysanthemum display will unfold as a focal point. Presentations of a five-sphere topiary, large disbuds and beds of colorful plantings will complement this feature in the nearby Earl and Donnalee Holton Victorian Garden Parlor. Outdoors, expansive beds of lush chrysanthemums will be arranged in large sweeps of color and will be balanced by a variety of ornamental plantings. Activities such as the Fall Bonsai Show, Giant Pumpkins and Hallowee-Ones are full of family fun throughout the exhibition. 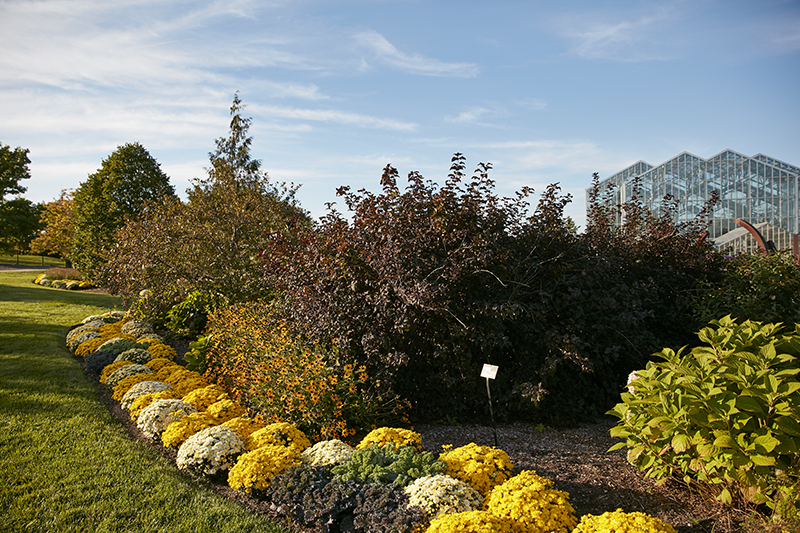 Mum Day on October 14 will give visitors a chance to take a walking tour led by horticulture staff, enjoy informational demonstrations and learn more about the chrysanthemum. The Balk Café will feature seasonal daily dinner specials on Tuesday evenings, with seasonal ingredients coming from Meijer Gardens’ own Michigan’s Farm Garden.